Cozumel Dive Professional Loses Life in Tank Explosion Accident | Dive Industry Association, Inc.
On August 26, 2014, Juan Canche Koh lost his life when a scuba tank exploded while being filled. 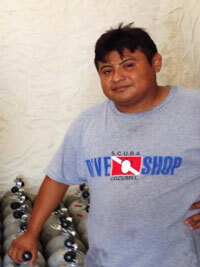 Juan was a long-time staff member at Scuba Club Cozumel Dive Shop. You’ll remember him from his friendly smile and the fact that you always had a steady stream of air and Nitrox at the dive center. Juan was in charge of the fill station for many years and was a permanent fixture around the dive shop, always happy to help one and all who needed it. Juan died of injuries suffered from the onsite accident. He will be sorely missed by all of us. Please keep his family and extended family at Scuba Club Cozumel Dive Shop in your thoughts and prayers. Our thoughts and prayers are with his family and friends and we appreciate all your thoughts and prayers at this very sad time. Some of you have asked how they can donate to Juan’s family. Please contact Sofia at sofia4scc@gmail.com as she will have this information. Donations to assist Juan’s family can be sent directly to the family in Cozumel or sent to the Dive Industry Foundation, care of the Juan Canche Koh Memorial Fund. To send Directly to Juan’s Family: Please use Western Union, to: Name: Silvia Sobernis (paternal) Rangel (maternal). State: Quintana Roo. City: Cozumel. Mobile Number: 987-117-3876. You will receive a tracking number (MTCN). Send the tracking number to Scuba Club Cozumel, Attention: Sophia at sofia4scc@gmail.com Juan’s wife Silvia will need the tracking number to be able to pick up the money. To Send Donations in the United States: Send check or money order to Juan Canche Koh Memorial Fund c/o Dive Industry Foundation, 2294 Botanica Circle, West Melbourne, FL 32904. Dive Industry Foundation is a U.S. non-profit, tax exempt, 501(c)(3) charitable organization. Donations may be made via money order, check, credit card (Visa, MasterCard or American Express). Payments may also be made using PayPal. Account: gene@diveindustry.net Tax deductible receipts provided to all donors. If you are a member of the diving community and have ever dove in a resort destination like Cozumel, Mexico, you know that your enjoyment of the diving there was because of diving professional like Juan Canche Koh. You also know how hard these dive staffers work to make your vacation enjoyable. We ask that you give $5, $10, $20 or more to help with Juan’s final expenses. Any amount is a blessing. Think of this as Juan’s final tip. Thank you for your generosity. This entry was posted in Charity, Non-Profits. Bookmark the permalink.